UMO extruder wheels dont meet ? Posted May 29, 2017 · UMO extruder wheels dont meet ? I took my old ultimaker one out of the box and wanted to try out a new print. Did I use too much force ? Ive tried to push it a little more towards the motor wheel but it doesnt buldge and Im afraid to break anything. should I take it apart again ? also the little black thing on the other side fell off I think this kept everything in place ? What should I do If anyone could help that would be great Thanks ! >> also the little black thing on the other side fell off I think this kept everything in place ? I still have that thing. Do you maybe know what is the best way to put everything in place again ? Should I detach everything (hope not) ? Ive looked at the manual but its a bit hard to understand what to do from that. Unless there is something I don't see, it is rather simple -- nothing to take apart. 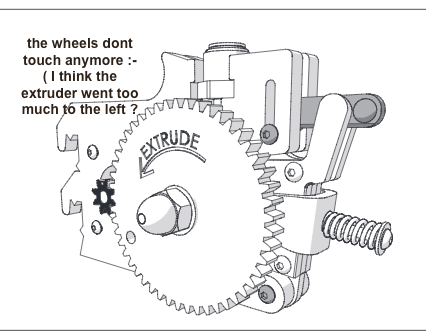 Open the filament feeder part, so everything is free, than just push the main gear in place, when it is fully pushed against the wooden part, the groove on the axle should be flush on the other side and that's where you put the clip. If the groove is not flush with the wooden part, you will have to add/remove shims. If the gear is no more secured on the axle (unscrewed) that's another story, but let's confirm what the real issue is first.